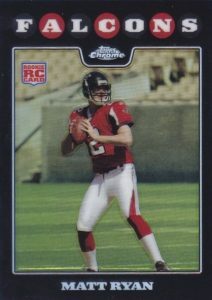 Much like his pro career, Matt Ryan rookie cards have been overshadowed by other quarterback greats for much of his time in the league. 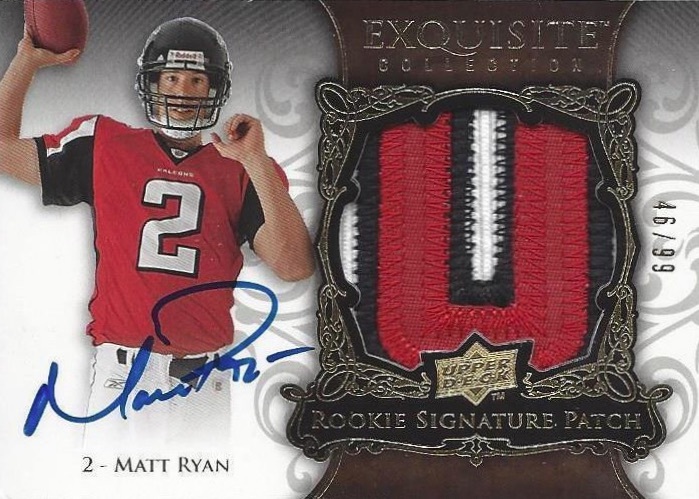 However, a fantastic 2016 season has led collectors back to 2008 products in search of Matt Ryan rookie cards. We count down some of his very best first-year cards in the guide below. The Boston College grad was selected third overall by the Atlanta Falcons and started strong with the Offensive Rookie of the Year Award. Although Matt Ryan has been a Pro Bowl-caliber quarterback for years, the NFL (and the hobby) is dominated by the QBs who win the big game. While Ryan has made several playoff appearances, that signature win has eluded him and the Falcons franchise. 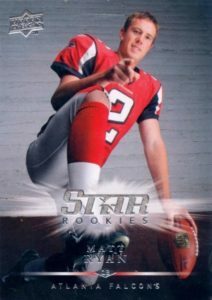 Shop for Matt Ryan rookie cards on eBay. 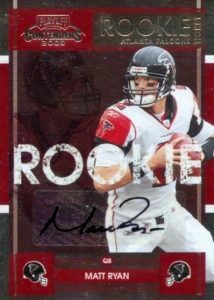 Debuting with collectors in 2008, there are a staggering 40 Matt Ryan rookie cards in his full RC checklist. Aiming to cut down on that number while still offering a comprehensive look at the many key choices, the list below features the 20 best cards among his official rookies. 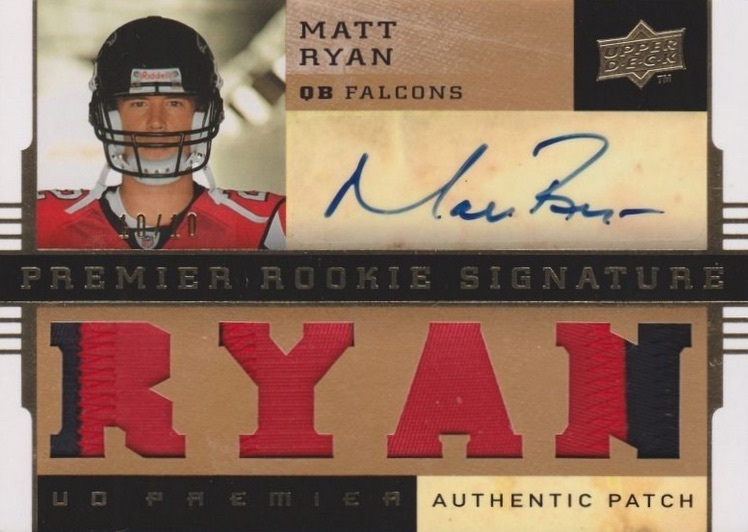 Covering many of the most valuable and popular offerings, the Matt Ryan top list features all of his signed rookie cards. Click on the images or listings below to shop for cards on eBay. 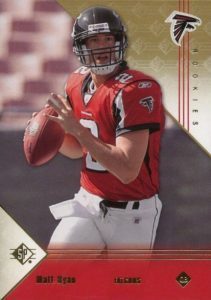 An interesting base option, not so much for the individual cards but the variety of Matt Ryan rookie cards in the set. Ryan has five different cards in the main portion of the checklist. The first card (#143) is his main release while the other four foil-heavy cards look back to prior SP designs (1993 to 1996). These retro versions also have limited signed parallels like the 1996 version (#345) below. Perhaps not the most visually appealing choice, Ryan's 2008 Bowman Chrome rookie card is a budget option that is still popular with collectors. Rare Refractor parallels amp up the values. 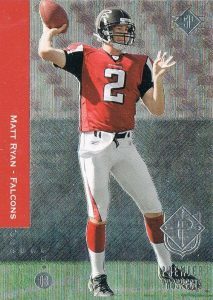 Simple and largely inexpensive, the Matt Ryan rookie card in the main Upper Deck set of the year is technically a short print but still very accessible. 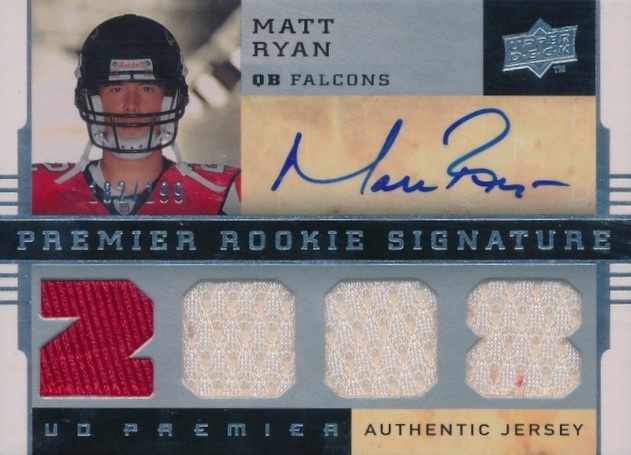 It also gives collectors an early look at the cool confidence of "Matty Ice." 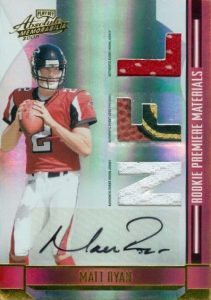 Always a rookie favorite, the '08 look for Chrome is a tad more cartoonish than normal with the bubble letters and multi-color fill. Still, just like Bowman Chrome, the brand recognition and Refractors push it to another level. 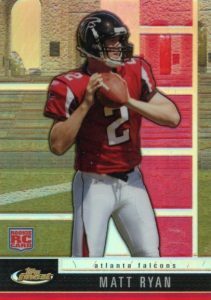 Busy but still fairly low-key for Finest, the design for this Matt Ryan rookie card relies on the main player image that pops. Limited to 699 copies, there are, of course, more limited Refractor parallels to chase. 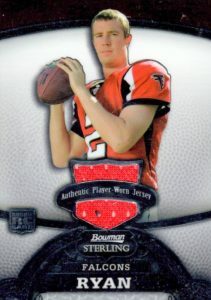 Found in two different versions, the main Matt Ryan rookie card in 2008 Bowman Sterling contains a player-worn jersey relic. There are also several more-limited parallels plus signed editions. 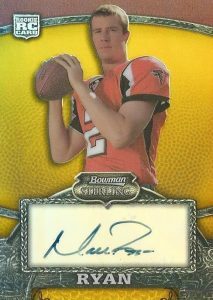 The Gold Refractor autograph parallel is shown below. 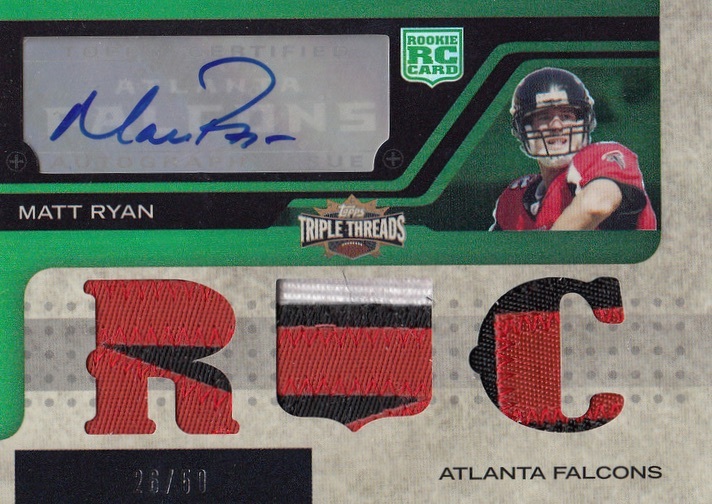 A concept more impressive in theory than execution, 2008 Donruss Threads brings signed letters that spell out R-Y-A-N. While the limited print run is nice, the long-term appeal is weakened given the tendency for the autograph to bleed and fade. 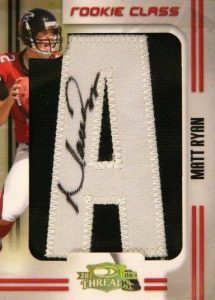 Likewise, displaying a similar issue to Donruss Threads, the 2008 SP Rookie Threads autograph is signed on a letter from Ryan's last name. Each card is numbered to 38 copies for a total of 152 across the run. 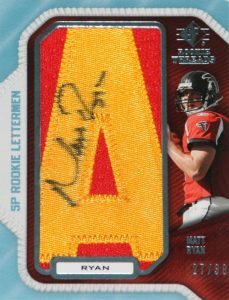 Slightly better than the signed letters above, Leaf Rookies and Stars supplies a manufactured logo relics for the Falcons. While the larger signing area is a plus, the same issues are in play as the letters. There are also several different versions, including all-jersey cards and a Boston College logo edition. 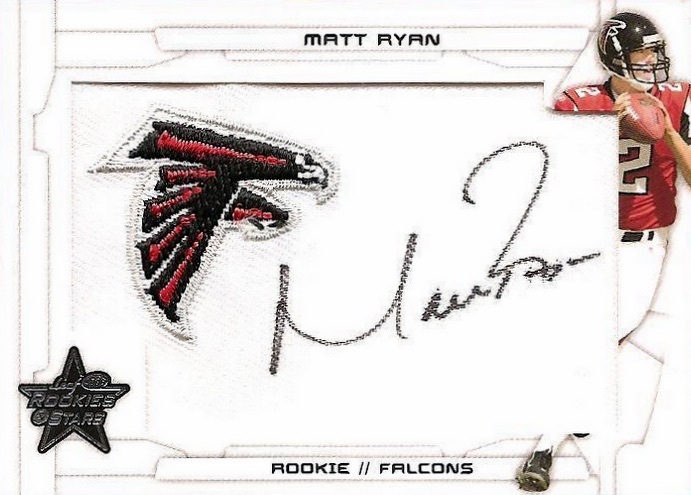 Directly highlighting his career with Boston College, the Matt Ryan rookie card in 2008 Donruss Elite applies a sticker autograph to a shiny design. The base version, numbered to 199 copies, is joined by several parallels, including die-cut versions. The first of several auto-relics with a sticker signature, Absolute also helps lay the groundwork for the hobby fascination with die-cut relics. In addition to several low-numbered parallels, collectors on a budget can find relic-only versions. 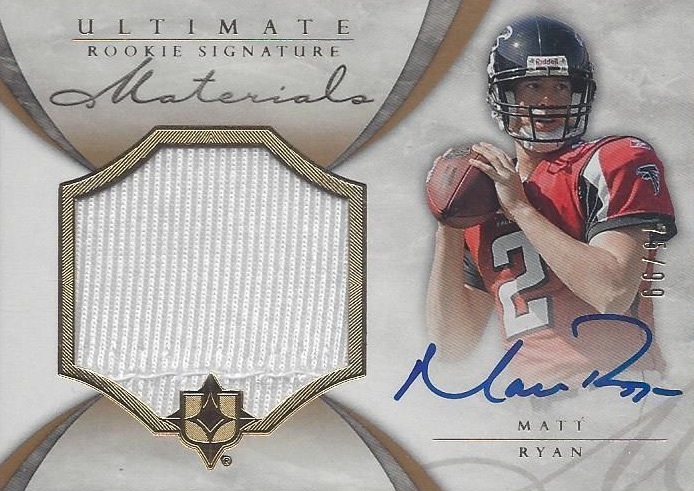 Not a lot separates the next few Matt Ryan rookie cards other than print run. 2008 SPx is the most plentiful of the group with 325 copies plus a few numbered parallels. With UD Premier comes a larger jersey piece along with a mugshot helmet photo for Ryan. 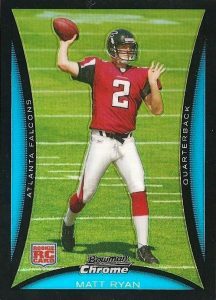 While the base card shows 2008, rare parallels switch the relic spelling to Ryan, like the Gold version below. 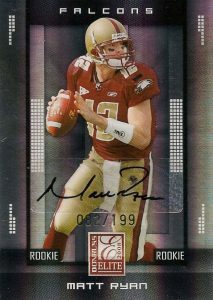 Seemingly one of the more traditional autographed relics designs, the Rookie Gridiron Gems subset in Donruss Gridiron Gear is actually fairly unique. As seen below, the signed jumbo relic piece can be pulled out of the card. 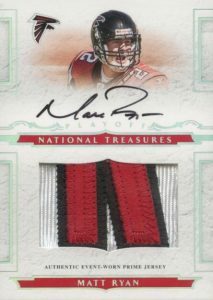 Very similar to the Gridiron Gear card as far as main layout, Leaf Limited does not feature a pull-out relic. 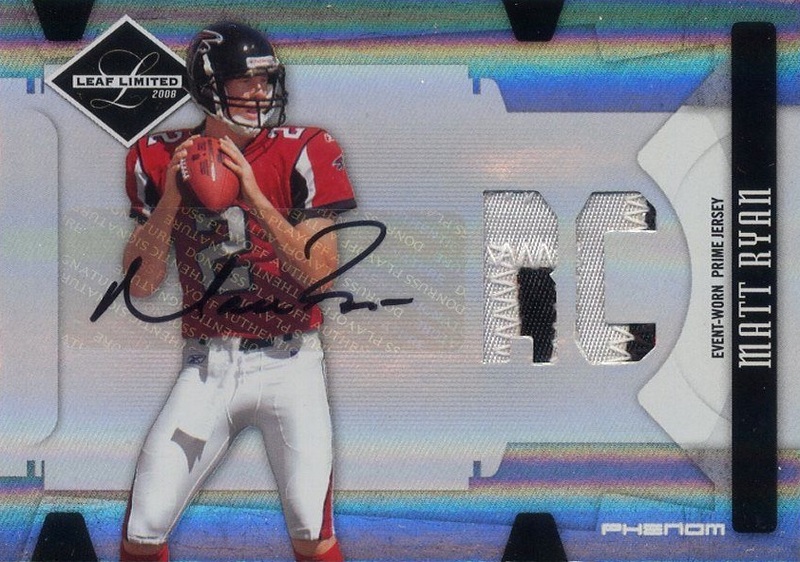 Instead, collectors can locate different die-cut designs, including a Falcons logo, #2 for Ryan's jersey number, and the main RC design seen below. 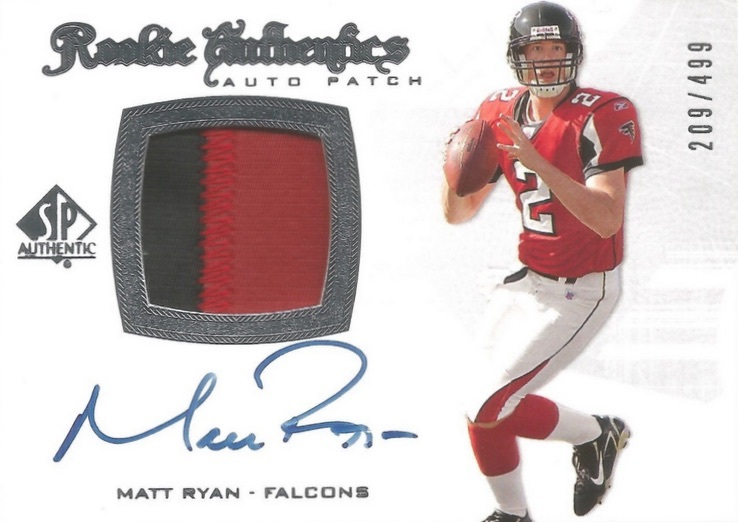 Likely the brand most associated with the die-cut relic concept, the Matt Ryan rookie card in 2008 Topps Triple Threads elects to fit the small player image into the corner, making the relic the main focus. While the print run is low at just 89 copies, another card that is technically an insert has a very similar look but with ATL as the relic spelling. 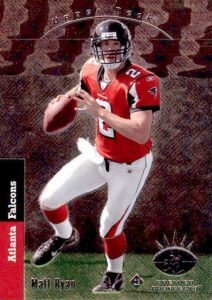 From this point in the Matt Ryan rookie card list, all the cards are quite popular and valuable, and #3 to #5 could easily swap spots. In spite of being the highest-numbered autograph, SP Authentic is still a hobby darling thanks to the on-card signature and patch piece. While still signed, the retail version (#150) is not numbered and does not have a jersey piece. A little more lost in the shuffle given its considerable rarity, the Ultimate Collection rookie might be the best-looking card on the list. Despite the on-card autograph, moderate relic piece and very low print run, Ultimate is one of the better values if you can find one. 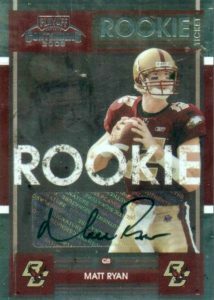 As many collectors know, Contenders doesn't play by the same rules as other in-demand rookie cards. 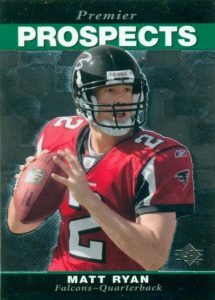 Even when they feature stickers, like the Matt Ryan rookie card below, they still end up being one of the most popular choices. Although the card is not numbered, the total number is reported to be 246 copies. Ryan also has a much more limited Boston College version. Despite feeling a little cramped, National Treasures is still National Treasures and that means a spot reserved near the top of the list. Checking off all the boxes, the on-card signature, quality patch and low print run results in a card that is only eclipsed by one other option. 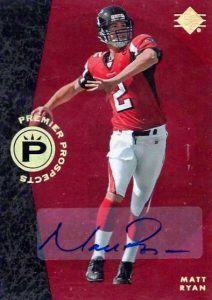 Ornate and visually impressive, 2008 Exquisite Collection matches the NT card in every category and manages to best it thanks to the slightly higher brand following and overall value. One negative is the seemingly confined signing area that impacts the autograph.